It is hard to say whether or not there has been a book that has made a greater impact to American home cooking as the Joy of Cooking. This extraordinary cookbook that the New York Times has called "the Swiss Army knife of cookbooks" received a face lift late last year as the 75th Anniversary Edition was published. Does everyone need a copy of Joy of Cooking in their kitchen? Should you buy this edition if you have a previous one? The answer to both questions is a resounding "yes"! The introduction of last year's 75th Anniversary Edition of Joy of Cooking has brought back the magic of the pre-1997 editions. This 2006 edition keeps the good parts of the 1997, but ditches a lot of the bad. Entire chapters that were missing from the previous edition have returned such as the section on canning and homemade ice cream. Gone is the 14-in-1 cookie recipe, replaced with a collection of individually tailored cookie recipes (which are hopefully better). Also new is a section on "cook for a day, eat for a week" (although only 2 half-pages are spent on this topic), sushi (1997 had one recipe for Japanese rice that mentions sushi, but doesn't tell you how to blend the vinegar; 2007 has expanded to cover sushi rice as well as maki sushi), extensive high-altitude discussions, and slow cooker recipes. The tone of the cookbook is also greatly improved making it much more readable than the 1997 version. Updated ingredient information and health and diet recommendations bring the Joy of Cooking up to the current prevailing theories. As compared to the 1997 edition, the layout and font have been modernized. Making the book easier to reference while in the kitchen, a clean, crisp sans serif font replaces the old serifed ones. As a result, the signature method of listing ingredients (within the recipe procedures, indented, and bold) is much easier to spot and read. In addition, the introduction of symbols to highlight important principles and high-altitude tips makes it easier to find helpful pointers. The image shows the same recipe from both the 1997 (on the left) and the 2006 (on the right) editions to demonstrate the updated recipe style as well as typography design. 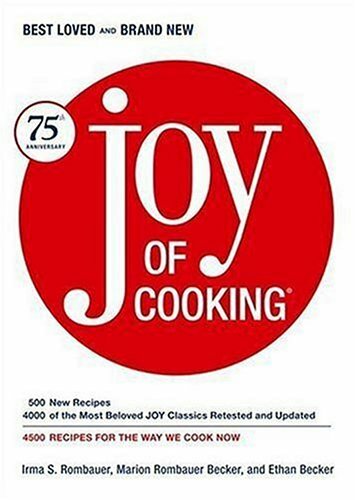 Naturally, if you don't have a copy of Joy of Cooking, you should pick up a copy of the 75th Anniversary Edition - it'll soon become your go to cookbook for finding the "standard" recipe for just about any dish you'd expect to be prepared in an American home. If you already have a previous edition, then this new edition is a great replacement/update (especially if you have the 1997 version). Also, be sure to check Simon & Schuster's errata page for any misprints. Since you gave the book a good review, you should put a link to the book in the article; I don't see any. I can't believe I forgot to link to the books. I put in links to both the 2006 edition and the 1997 edition (don't buy this one, just look at the picture to help you identify if you own it...) into the article. I have a spiral-bound facsimile edition of the '75 version. It's worth noting that the '97 version crappy typography was another gratuitous change, and that the 2006 typography seems a reinterpretation of the better '75 version. Great article. Do you know where I can buy the 1975 edition? I actually have one, but it is falling apart and some pages are missing. I suggest that all check out the website for the JOY family www.thejoykitchen.com. It has a great review of JOY history, recipes, a forum and much more. My wife and I got Joy of Cooking as a wedding gift (quite a few years ago now), and it's always been a great help. The peanut butter cookie recipe is perfect! I still remember that it says something like, "For those who dote on peanut butter cookies...." That's me! I recently purchased the new edition of Joy of Cooking. Getting somewhat sick of most typical cookbooks which, while good, tend to present very specific versions of recipes. A simple beef stew? Nah the typical cookbook gives you beef stew with glazed carrots and ginger (okay not really, that sounds not so tasty). I haven't actually had a chance to make anything from Joy of Cooking yet but reading through it, it seems to provide plenty of 'general' recipes. Recipes that are simple enough to provide a cook with a base recipe that can easily be customized once the basic recipe is understood. Yeah. I'm going to keep this one handy. We have had the Joy of Cooking for a long time. It is a touchstone of cookbooks. A standard reference. I reccomend it to anyone who wants to learn to cook from scratch. I have made many things from its pages, and have never been disappointed. Wow, by coincidence I have started to buy organiy meat from a nearby Bavarian farm, and the lady who runs it is American who has been in Germany since 1953. She lent me her original 1954 edition which I fin fascinating. Although a Brit I find many recipes in common with us in Britain so am reading lots of it at the moment. Regarding the stand, I always make a copy of the recipe before I create the dish. I am fortunate to have a photo copied printer at home, so it is easy enough to stick a magazine or book on the machine and copy the recipe. For those of you who DOTE on peanut butter cookies....try these rich and crumbly ones! THE best p.b. cookies ever and so many great American recipes. So many of my old cookbooks went out of fashion but not this one! if your layout permits a "good spot" it a boon - works for JOC - but the "oversized" formats don't fit on the platform.